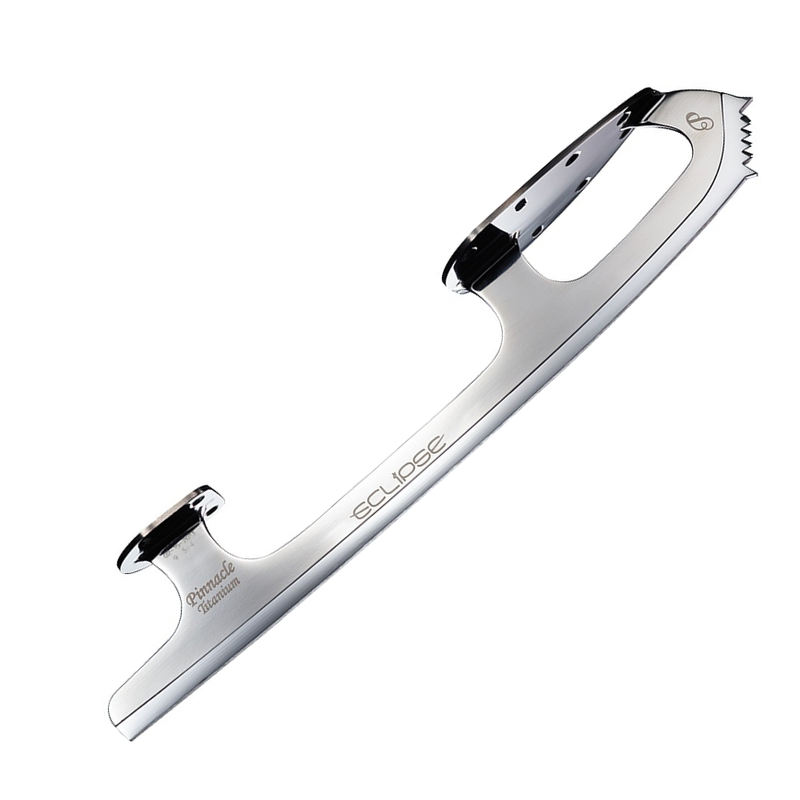 Much like competitive skating boots, figure skate blades are as unique as the skaters who wear them. Here you will see the lines of blades that The Skater’s Edge sells primarily to mid-level/intermediate to advanced skaters. 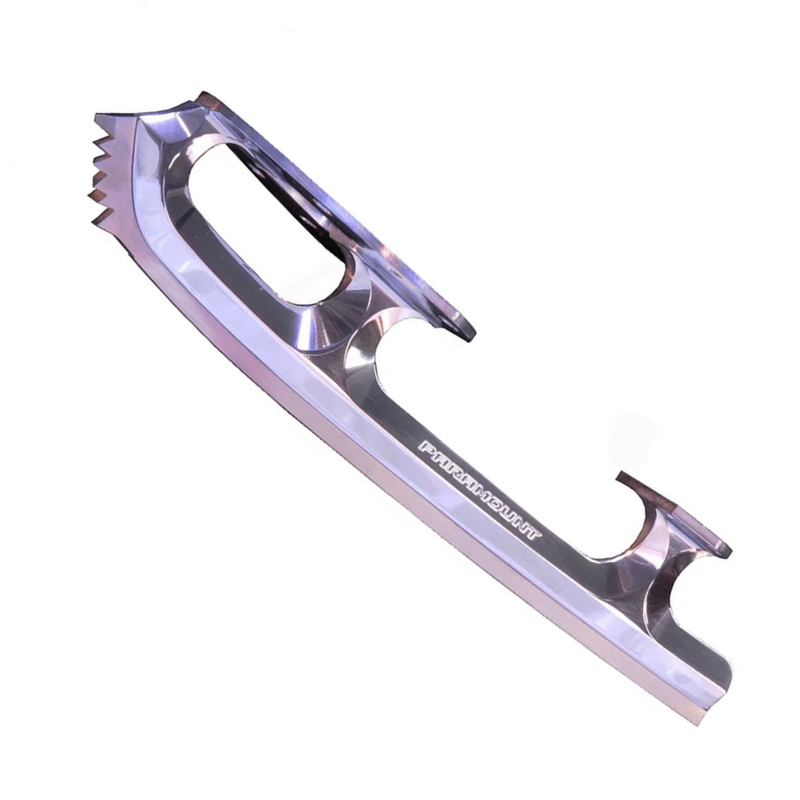 Unlike some sports equipment, the most expensive or high end skate blades will not add to your skating. Having the correct blade for your skating level is very important! Ask us about the best blade for your best performance at your next fitting appointment! Riedell’s Eclipse blades are light, fast, and beautiful. Held to a high quality of craftsmanship, and made with only the finest carbon steel, aluminum, and titanium, Eclipse blades are sure to be your new favorite blades! Cosmos - Ideal for singles through Axel. Aurora - Ideal for double jumps. Quantum - Ideal for single and double jumps. Aluminum holder provides the lightweight experience! Infinity (and Infinity Titanium) - Ideal for double, triple, and quad jumps. Pinnacle (and Pinnacle Titanium) - pictured! - Ideal for double, triple, and quad jumps. John Wilson is the longstanding industry standard for innovation and technology. Wilson blades are strong, precision-cut, and finished at the hands of master craftsmen down to the last millimeter. Coronation Ace - Ideal for single jumps through Axel and into doubles. Coronation Dance - Ideal for ice dance and synchronized skating. Pattern 99 - Ideal for double, triple, and quad jumps. Gold Seal - Ideal for double, triple, and quad jumps. Revolution Blades - same radius and toepick pattern you love, but less of the heavy steel dragging you down! Revolution Blades replace the steel toe and heel plates with carbon composite technology to provide a lighter blade with more flexibility and cushioning on jump landings. Coronation Ace Revolution - Ideal for single jumps through Axel and into doubles. Pattern 99 Revolution - Ideal for double, triple, and quad jumps. Gold Seal Revolution - Ideal for double, triple, and quad jumps. Jackson Ultima, Apex, and Matrix blades are driven to achieve lightweight performance. Ultima intermediate blades have a unique cutout design and cutting edge technology. Apex blades have a titanium coated, tapered edge for enhanced speed and control. Matrix features a blade holder crafted of lightweight aircraft aluminum, and a stainless steel runner that will hold an edge for longer than carbon steel. Legacy - Ideal for single jumps through Axel and doubles. Elite - Ideal for double, triple, and quad jumps. Freestyle - Ideal for double, triple, and quad jumps. Supreme - Ideal for double, triple, and quad jumps. Nova - Ideal for double, triple, and quad jumps. Finesse - Ideal for ice dance and synchronized skating. Legacy 7 - Ideal for double jumps. Legacy 8 - Ideal for double jumps. Apex Elite - Ideal for double, triple, and quad jumps. Apex Synchro - Ideal for synchronized skating. Apex Dance - Ideal for ice dance. Apex Freestyle - Ideal for double, triple, and quad jumps. Apex Supreme - Ideal for double, triple, and quad jumps. Mitchell & King Blades have been around since 1951, and their reputation for excellence at National, World, and Olympic competitions is hard to match. They employ a 55-step process in their steel cutting, hardening, and tempering to make the best possible blades. Galaxy - Ideal for single jumps loop through Axel. Professional - Ideal for single jumps through Axel and doubles. Dynasty - Ideal for synchronized skating. Dance - Ideal for ice dance. Phantom - Ideal for double, triple, and quad jumps. Gold Star - Ideal for double, triple, and quad jumps. Professional Revolution - Ideal for single and double jumps. Phantom Revolution - Ideal for double, triple, and quad jumps. Gold Star Revolution - Ideal for double, triple, and quad jumps. Paramount’s blades are known for their distinctive aluminum holders, extremely tough steel runners, and versatile customization options. They offer three distinctive toepick patterns that closely resemble MK and Wilson’s blades, and their computer machined profiles are incredibly accurate.